The Fluffy Hearts Valentine Cowl is fabulously lofty and bright, crocheted with faux fur yarn! 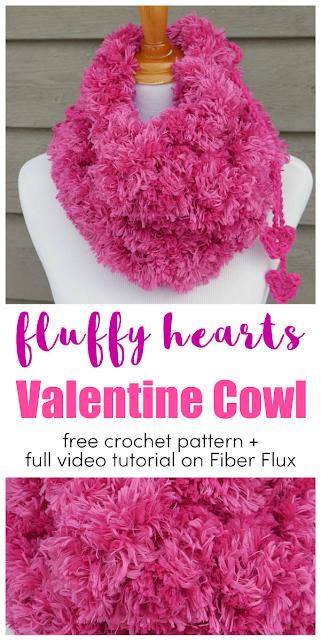 A cute heart drawstring helps cinch it up to keep you extra cozy too! 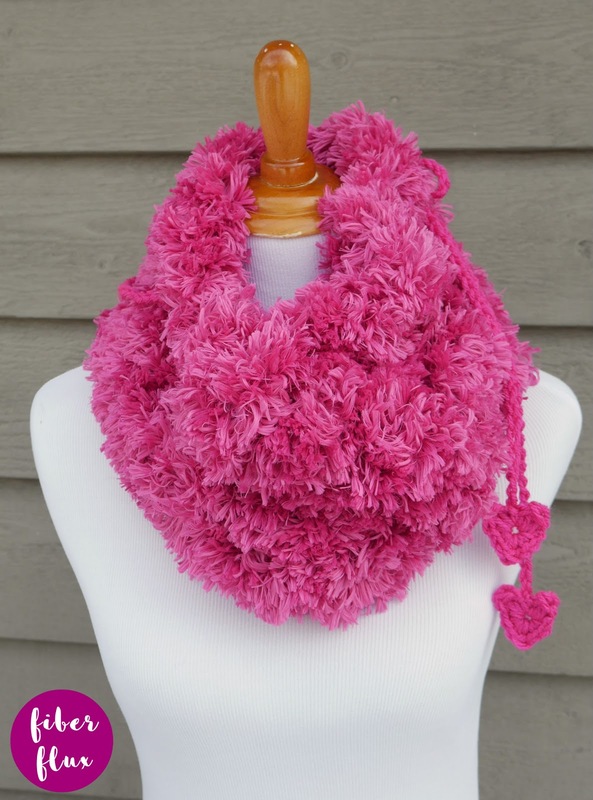 3 Skeins Red Heart Fur ("Azalea" colorway shown). 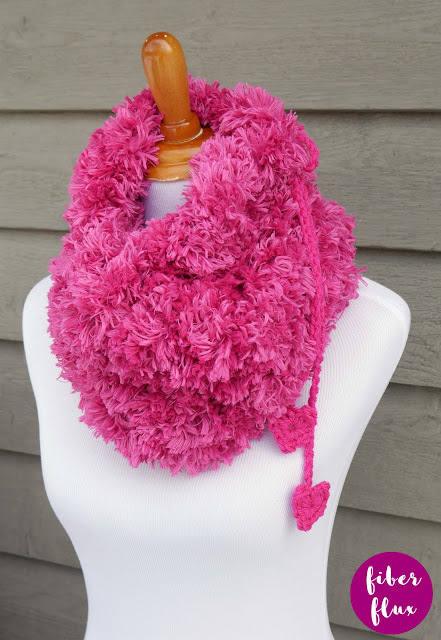 Check out my 10 tips for working with faux fur yarn! Row 1: In the 4th chain from the hook, work a (dc, ch 1). *Skip a chain then work (dc, ch 1) in the next ch. Repeat from * across. Row 2: Ch 4 and turn (counts as a dc, ch 1). Work a (dc, ch 1) in the first space and in each space across. Repeat row 2 until piece is about 28 inches from starting edge leaving a long tail for seaming. Sandwich two edges together and work a whip stitch to seam together using either a large tapestry needle or even your fingers. Weave in any ends that remain. To make the drawstring, make a chain about SSSS inches long and leave the tails at either end for attaching the hearts later. Set aside and proceed below to make hearts. Round 1 (work all stitches into the ring): dc, tr, dc, sl st, dc, tr, dc, sc, sc, sc, tr, sc, sc, sc, join to close heart with a slip stitch and fasten off. Before you sew the hearts, weave the drawstring through the top edge of the cowl. 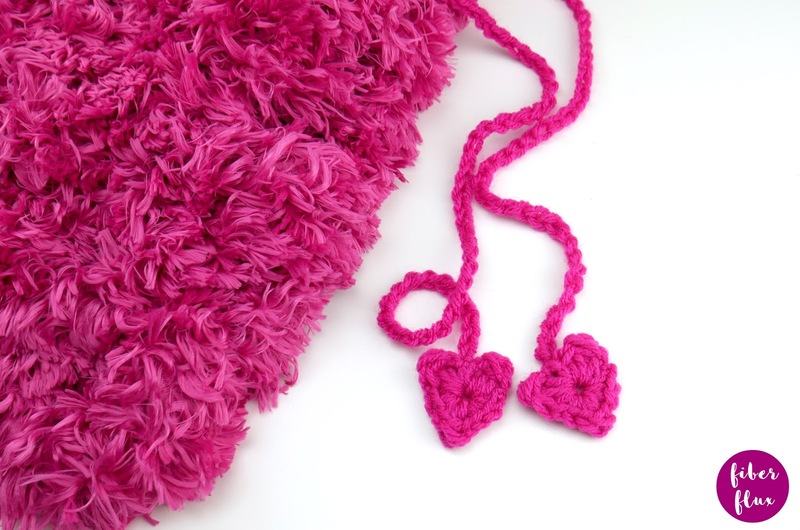 Using the tails from the drawstring, sew a heart to each drawstring end. Weave in any ends that remain.